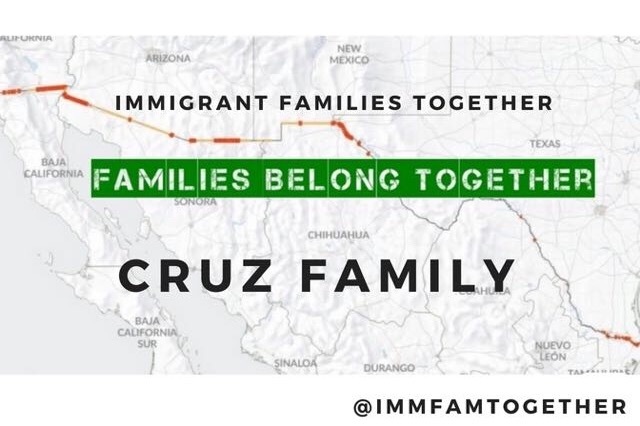 Cruz and her daughter were two of some 4000 parents and children who came to America seeking refugee asylum but were cruelly separated and locked apart from one another. That happened to these two in May. Cruz had fled to our country to escape a deadly situation, and our government decided she has a credible claim of fear and danger. She was released and is now going through the long process of seeking full asylum. But took 73 days before Cruz got out of detention and was reunited. Cruz is a really industrious person but she can't work for at least 5 to 6 months: that's part of the asylum process, and she needs to follow this rule or else she violates the asylum agreement. And, like many kids who went through this ordeal, her daughter is suffering from symptoms of PTSD. Cruz needs your help to tide her over the next few months. She needs to be able to pay bus fare to get refugee and therapeutic assistance. She needs school clothes for her daughter, who just enrolled in fifth grade. She needs to be able to go to the grocery story to buy good food. Mostly she needs not to worry -- and to heal. Can you help welcome this family as they become part of our country and for her and her daughter to heal from the trauma they have endured here? 2. Paying bonds and providing or coordinating pro bono legal representation to fulfill all legal responsibilities while awaiting trial so that they may be with their children. 8. Providing sustaining funds for families undergoing the immigration process. We are from across the United States. We are not related to Cruz or her attorney by blood. We are a community of concerned parents and citizens who don't support current anti-immigrant policies and want to do our part to support these families throughout the legal immigration process. We will withdraw all donated funds to Julie, the leader/organizer/founder of Immigrant Families Together. They will then be transferred to her attorney or Cruz.